Scientific clarification might be needed regarding the 'zinc spark' which has been captured using fluorescence microscopy in the laboratory. A chemical tag needs to be used to see the 'spark' as a release of energy, which otherwise would not be detectable within the spectrum of light that the human eye is capable of seeing. The 'spark' is the result of the high calcium levels causing zinc to be released outside the egg. 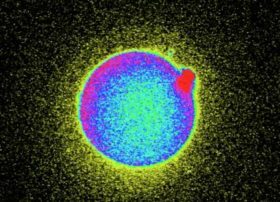 None the less, “Conception” means to first come into existence, and it is a beautiful word—a word that unites faith and science. The spark of life is divine. Life is God's will. He is the author and the Creator. He gives life and he takes life, but his desire is that we should have life everlasting. At times life is hard. However, whether life is hard or easy, God wants to have a relationship with all of us, you and I included. He wants you to trust him, talk to him, pray to him, and ask him for wisdom, guidance, and faith. Protecting the innocent and the defenseless is a noble cause. Planned Parenthood aborts more than 320,000 innocent babies each year. Don't be fooled by their name, they are in the business of convincing women to have an abortion. Planned Parenthood takes $1.5 million of American taxpayer's dollars every single day. The decision to abort a pregnancy is a decision that should be God's alone. The developing child in the womb has done nothing to deserve such a violent ending. Unborn babies need you to speak for them. God gave you a voice and your voice deserves to be heard, whether it is heard by one or many. Some may argue that the embryo which develops into a fetus is not a life…yet if simple bacteria were discovered on Mars the very same people would celebrate it as 'Life on Mars!'. If you or someone you know and love has had an abortion, know that God is ready to forgive those who acknowledge their sin, label it for what it is, and repent. If you are considering an abortion, stop, wait, don't go through with it. There is no shame for bringing life into this world. There are hundreds of thousands of parents who want to love your child if you are unable. Adoption is a much better choice than abortion. Say 'Yes' to life. You might be afraid, that is natural, just know that God will see you through it. The truth is, everybody has a sin nature. Human nature is to do what is best for oneself…to avoid pain and to avoid inconvenience. God has already provided us with the answers to life's hard questions which can be found in the Bible. In Jeremiah 29:11-13 God says, I know the plans I have for you, plans to prosper you and not to harm you, plans to give you hope and a future." His name is Yeshua and he is Salvation.